LOS ANGELES – Under sunny skies at Compton’s Thomas Jefferson Elementary School, DeMar DeRozan’s and Spencer Dinwiddie’s distinct paths to the NBA converged for one day. 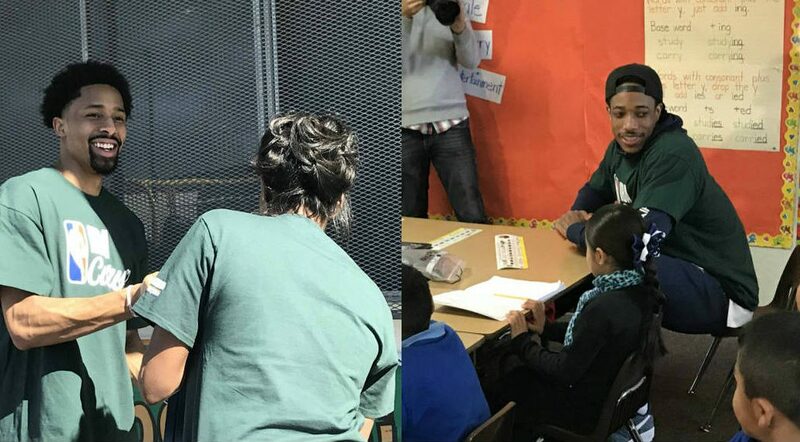 Visiting a class of first-graders Friday, the Compton-bred DeRozan, 28, helped students spell words like “train,” while Dinwiddie assembled an NBA-themed signpost, helping decorate a new playground built by NBA service partner KaBOOM! At first glance, DeRozan’s and Dinwiddie’s stories seem alike. Both are tall, lean guards from the greater Los Angeles area, and they’ll both take part in major events during this year’s All-Star weekend. Both even play in the Northeast — DeRozan for the Toronto Raptors and Dinwiddie with the Brooklyn Nets. Dinwiddie grew up in the ritzy L.A. suburb of Woodland Hills, a far cry from Compton. DeRozan dreamed of playing professional basketball, but inspiration could be hard to come by. Woodland Hills, on the other hand, lies next to celebrity-filled Calabasas, home to the Kardashian clan and former stars like Scottie Pippen of the Chicago Bulls. That perspective brought even more meaning to Dinwiddie on Friday. On the court, things were flipped. Top college programs swarmed DeRozan during his teenage years, determined to land the 5-star recruit averaging more than 29 points per game for Compton High School. DeRozan’s monster stats and considerable potential earned him invites to LeBron James’ and Kobe Bryant’s high school camps, as scouts earmarked him as a future NBA player before he even set foot on USC’s campus. Dinwiddie averaged 11 points and eight assists per game as a senior at William Howard Taft High School before attending Colorado as a relatively anonymous 3-star recruit. He encountered countless setbacks — including a torn ACL months before entering the 2014 NBA Draft — while working without the stage DeRozan had. Now, DeRozan leads the Eastern Conference’s first-place Raptors in scoring, while Dinwiddie ranks 24th league-wide in ESPN’s Real Plus-Minus, a stat that measures a player’s effect on his team’s scoring margin. As Dinwiddie works to improve his status from that of a solid starter to more, perhaps the two will share a bigger spotlight in the near future. Previous PostInside the sights, sounds and people of the Fake All-Star Saturday NightNext PostFilayyyy hits L.A.